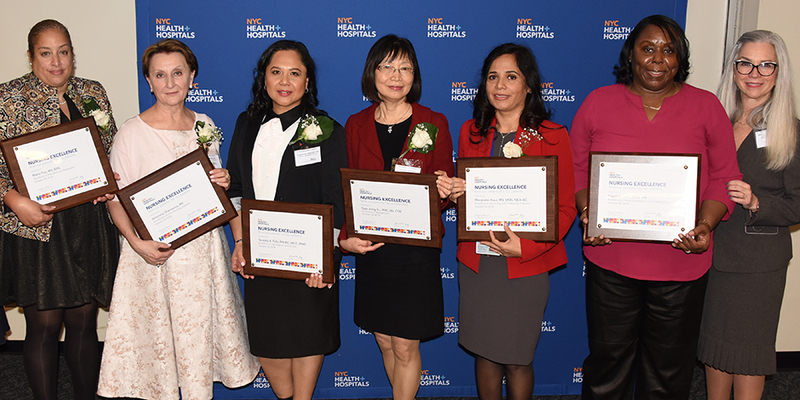 This year’s Nursing Excellence honorees: Maria Fox of NYC Health + Hospitals/Woodhull; Antonina Shamarina of NYC Health + Hospitals/Bellevue; Teresita Pido of NYC Health + Hospitals/Carter; Tsae Jiang Su of NYC Health + Hospitals/Lincoln; Manjinder Kaur of NYC Health + Hospitals/Coney Island; and Carol Stewart of NYC Health + Hospitals/Harlem. NYC Health + Hospitals honored six nurse professionals today from across the public health care system, as part of its annual Nursing Excellence Awards celebration. The awardees are nurse trailblazers who demonstrate leadership in various capacities. Also honored was the Hunter-Bellevue School of Nursing, earning the health system’s “Nursing Champion” award for demonstrating support for nurses and the nursing profession. While nursing is a second career for Ms. Shamarina, caring for others has always been her passion. She says she left the economics sector for child psychiatry because she was looking for something new and challenging. “In child psychiatry, we recognize that children are bio-psychosocial beings. In this setting, I can provide truly holistic nursing care, taking into account the mind-body connection and developmental stage so that we can truly meet each patient’s needs,” she said. 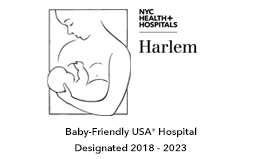 Since 2010, Ms. Shamarina has been a staff nurse at NYC Health + Hospitals/Bellevue’s Children’s Comprehensive Psychiatric Evaluation Program Unit, one of three in the nation dedicated to the evaluation and stabilization of pediatric behavioral health patients. Though the admission process for child psychiatric patients can be difficult, she brings comfort by treating every child as if they were her own. “I make it a point to talk to each child so that I can understand their story,” she said. “By gaining insight into their understanding of why they are in the hospital, I am better able to provide meaningful patient-centered care. “Each child is different and special and in their own right. By taking the time to hear their story, I am letting them know that they matter, because they do,” she said. Ms. Shamarina earned her nursing degree from New York Technical College and also holds a Master of Science degree in Economics from Moscow University, Russia. When my patient makes good progress and improves, and realizes self-improvement, I am most proud,” said Tsae Jiang Su, RNC, who is recognized for being a bundle of energy, passion, and expertise. At NYC Health + Hospitals/Lincoln since 1993, Ms. Su provides care to around 20 patients each day, providing critically important diabetes management and lifestyle changes to every individual she sees. In the South Bronx, diabetes affects a disproportionate share of the community. “Mentors encourage, inspire, support and teach nurses to be patient advocates, innovators, and champions of excellent patient care,” said Maria Fox, RN. As the health care landscape continues its transformation toward patient-centered, team-based care, Ms. Fox is devoted to being an educator and mentor for the next generation of nurses. Her experience in utilizing the nursing process and synergy model to address patient trauma and acute illness allows her to develop immersive, evidence-based curricula tailored to various education needs. With 8 years of experience as a staff nurse at NYC Health + Hospital/Woodhull’s emergency department and Surgical Intensive Care Units, Ms. Fox has delivered health care services at points of care that are critical to great patient outcomes. Working in NYC Health + Hospitals/Woodhull’s fast-paced Emergency Department, where quick thinking and swift action is required, she gained valuable insight into the essential characteristics of a competent nurse. In her role as Assistant Director of Nursing Education, she strikes a balance between constructive criticism and celebrating her students. “Mentors are role models that demonstrate accountability, adaptability, caring, compassion, empathy, and assertiveness in a challenging and dynamic health care environment,” she said. She believes that continuing education is crucial for nurses’ professional development. “Continuing education provides the opportunity for professional nurses to enhance their knowledge, skills and, attitudes in delivering excellent care to patients,” she said. Ms. Fox has a Bachelor of Science degree in Nursing and is presently pursuing a Master’s degree of Science in Nursing Education. “The challenge of making our health care system safer is my number one goal, and nurses are the key stakeholders in accomplishing this goal,” said Manjinder Kaur, RN. With over 12 years of service at NYC Health + Hospitals, she is in the vanguard of nursing professional development. Ms. Kaur has taken the lead in implementing several projects aimed at improving patient safety and standards of care. Her more notable accomplishments include reducing patient wait-times for an EKG from nearly an hour to 9 minutes, increasing Press Ganey scores for ED Nursing by 14 percent, improving Bar Code Medication Administration compliance, and overseeing successful transition to EPIC Electronic Medical Record over a three-month ED operational action plan. She has developed ED orientation curricula, led nursing preceptor and mentorship programs, and created e-learning modules with CE credits for training and professional development. Buzzwords that guide Ms. Kaur’s approach to advancing nursing professional development include teamwork, effective communication, progress through learning, and patient-centered. By collaborating with multiple departments, she has created tremendous value and respect among physicians, nurses, and other staff and has elevated the level of patient care. Her commitment to being a catalyst for nursing excellence has inspired her to pursue a Doctorate of Business Administration in Healthcare & Leadership. She earned a Master of Science in Nursing Informatics and a Bachelor of Science in Nursing from Excelsior College. In her native India, she also earned a Diploma in Nursing and Midwifery. 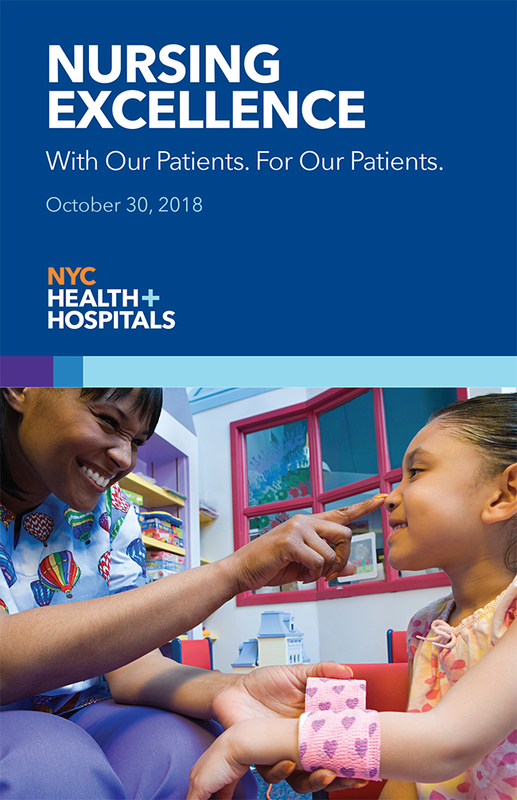 “Improving the quality of services our nurses deliver to our patients gives me self-satisfaction, and it ensures that if a friend or family member visits NYC Health + Hospitals, I feel confident they will receive excellent care,” she said. “Ambulatory care nursing provides multiple opportunities as well as challenges for nurses…being afforded the opportunity to serve our patients from newborn to young adulthood is a rewarding experience,” said Carol Stewart, RN. With over 21 years of service at NYC Health + Hospitals, Ms. Stewart is widely known for her ability to remain calm during crises. But, she said that professional trait emerged partly from her personal life. Her journey to becoming a nurse began as a teenager when she served as a home attendant for the elderly. She found joy in listening to her patients’ life stories and making them laugh. The experience taught her to be responsible and caring, and changed her life. In college, her mother became terminally ill, forcing her to acquire skills that would nurture her family and form her future nursing career. “These are the experiences that propelled me forward to acquire a plethora of knowledge to serve the community, which brings me joy to know I am walking in my purpose,” she said. As Head Nurse at NYC Health + Hospitals/Harlem’s Pediatric Clinic, Ms. Stewart is known for her compassion. Recently, when migrant children separated from their parents were brought to the hospital, she was key in making sure the children felt comfortable and received quality care. She engaged them in the waiting area and through their visits. She is a team leader for NYC Health + Hospital/Harlem’s Pediatric Asthma program, which participates in the DSRIP program. With her problem-solving skills, she utilized resources to ensure children with asthma had access to important program services: home visits with an environmental assessment to identify asthma triggers, pest remediation services if needed, hypo-allergenic bedding, and reinforcement of the asthma action plan. Due to her leadership, she and her team have enrolled 280 children in the Pediatric Asthma Program. Ms. Stewart has a Bachelor of Science in Nursing from Lehman College, and an Associate Degree in Nursing from Bronx Community College. “Volunteering not only provides the opportunity to get involved in a cause that we are passionate about, it also provides the chance to look beyond our own circumstances and appreciate what others are experiencing,” said Teresita Pido, RN. “With 18 years of nursing experience in clinical and home care settings, she has cared for patients from newborns to geriatrics. Her nursing career began in her native Philippines and has spanned the globe from Brunei to Riyadh, Saudi Arabia, then to NYC Health + Hospitals/Carter. Her international experience has undoubtedly influenced her passion for volunteering, philanthropy, and humanitarianism. Over the last five years, Ms. Pido has volunteered throughout the Philippines. She has brought joy to orphans through sponsorship and participation in a “Birthday party” at the Santo Nino Orphanage in Bacolod City. In addition, she participated in the distribution of food and school supplies to children in Patag and Itbayat, and established a scholarship program for indigent children in her hometown. But, her passion for volunteering isn’t exclusive to helping people. This year, she traveled to Surin, Thailand, to volunteer at the We Are Bamboo Company elephant sanctuary. It is clear that her commitment to being an excellent nurse is the professional manifestation of her love for people, and her volunteerism provides a balance and an outlet to share her expertise to those in need. Ms. Pido has a Bachelor of Science in Nursing from Riverside College in Bacolod City, Philippines.